An unlikely pair hits it off on The Big Bang Theory Season 9 Episode 24, and it's possibly one of the funniest things that's happened all season. 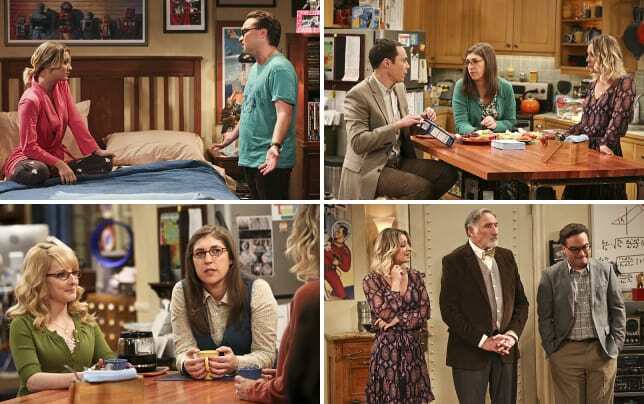 Penny makes plans for a wedding ceremony that can include their family and friends, which means another opportunity for Sheldon and Leonard's mothers to be in the same room. It also means we finally get to meet Leonard's dad! Penny's goal to bring Leonard closer to his mother is endearing. I'm sure she's excited about having another ceremony for lots of reasons, but her main motivation is for her husband to get that connection with his mom. It's all veiled in jokes, but his problematic relationship with his mother is actually pretty dark if you think about it. I watched an episode of The Big Bang Theory once with the laugh track cut out, and it makes it a very different (and very awkward) viewing experience. I bet if the laugh track was cut any time Leonard talked about his mother, it wouldn't seem very funny at all. Fortunately, that's not our typical experience, and everything about Christine Baranski's performance is fantastic. The same can be said for Laurie Metcalf. Those two together are completely hilarious, and adding Leonard's dad, played by Judd Hirsch, only brightens the dynamic. But what isn't expected (unless maybe you looked at those photos ahead of time! ), is for Leonard's dad and Sheldon's mom to hit it off. They get along right from the start, even bonding over their dislike of Alfred's ex-wife. To the dismay of Leonard and Sheldon (who of course doesn't catch on right away), they also end up going back to their hotel together. Penny, on the other hand, feels just the way I do about it. It's awesome, and pretty funny, too. 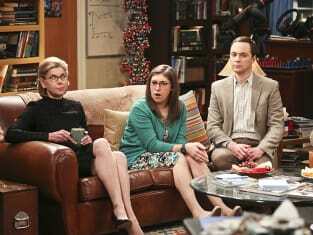 We don't get to see the ceremony yet, so I'm hoping that's how The Big Bang Theory Season 10 will begin. For a season finale, this one is funny and smart, but it doesn't quite feel like a finale should. Otherwise, it's a great episode, and I'm glad we're ending what begin as a rocky season on a high note! Naturally, Amy wants to be maid of honor, and she'll wear a frilly bridesmaid dress if she darn well pleases. Even if Penny isn't actually HAVING bridesmaids. Shouldn't Leonard also be told about that email from the government? It seems he'd need to be included in such a thing. Sheldon is right. You really shouldn't fill up on all that bread before a meal. We should probably all be worried about Raj's dental health.